Which DNA test should I take? Is it worthwhile? 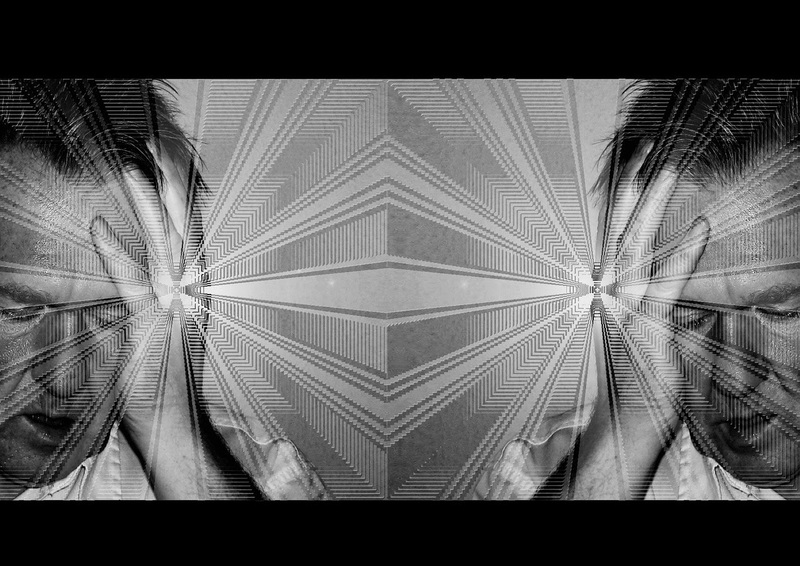 What will I learn? I see these and similar questions asked dozens of times a day on mail lists, forums, and social media sites. Some people recommend what worked for them, but what was "best" for us may not be best for the person asking today. 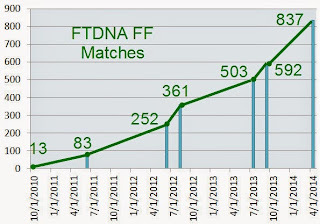 Chart of one person's number of Family Finder matches at Family Tree DNA over several years. A DNA test is the genealogical resource that keeps on giving: as more people test you will get more matches. 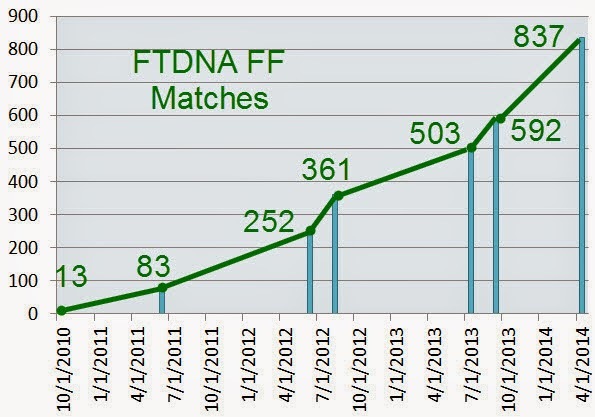 After taking a DNA test you need to periodically look at data for your new matches. You never know when the person whose DNA can solve your hardest genealogical problem will take a DNA test. Knowing how DNA test results could contribute evidence to answer your genealogical question is critical to knowing which test to take and where. So here are some specific questions with the answer I would give today. As companies change their lab procedures, sequencing techniques, databases, tool offerings, customer service, and we learn more about DNA, these answers might change. As new companies are formed, these answers might change. The three biggest genetic genealogy testing companies include Family Tree DNA, 23andMe, and AncestryDNA. For anthropological testing that may also be applied to genealogical research there is the National Geographic Genographic Project. Many other companies also offer specialty testing and analysis services for those unable to do the analysis themselves. The "big three" will be the primary focus of this article. For the tests that are offered by all three companies, the base price of the tests is the same, although sale prices can provide significant savings. To find out about sales read the posts of genetic genealogists on blogs, Facebook, mail lists, and forums. Debbie Parker Wayne, Partial Display of Mapped Chromosome Segments, 5 July 2014, created with Chromosome Mapping Tool by Kitty Cooper (http://kittymunson.com/dna/ChromosomeMapper.php : accessed 5 July 2014). Is it worthwhile to take a DNA test for genealogy? Yes, unequivocally for most of us. For yourself, how much you will learn depends on how much effort you are willing to put in to learning how to use DNA evidence. For more information see Debbie Parker Wayne, "Disappointed in DNA test results?," Deb's Delvings Blog, posted 16 September 2013 (http://debsdelvings.blogspot.com/2013/09/disappointed-in-dna-test-results.html : accessed 3 January 2015). There are hundreds of blogs posts out there from dozens of genetic genealogists on how to use DNA test results. For others, your DNA and family tree may provide the match needed to break down a long standing brick wall. Or for someone who has no knowledge of her biological parents to connect to family. For the future, one of the best reasons to take a DNA test is to "bank" your DNA or the DNA of elderly relatives for future testing. As much as we know today about DNA, more will be known in the future. Our grandkids and great-grandkids may learn more from our DNA than we will be able to learn. Today, Family Tree DNA advertises DNA samples will be stored to allow for testing in the future. Other companies may store leftover biological material, but they do not allow additional tests to be ordered at this time. No company can guarantee there will be enough stored material or viable DNA material for a particular test. But if the material is not stored and made available then there is NO chance of testing once a relative is deceased. Is one company more economical than the others? See Judy G. Russell, "2014: Most bang for DNA bucks," The Legal Genealogist blog, posted 6 April 2014 (http://www.legalgenealogist.com/blog/2014/04/06/2014-most-bang-for-dna-bucks/ : accessed 3 January 2015). A DNA test will provide several types of information: a list of other people in the database of the testing company who have DNA that matches yours and values for the DNA markers tested. Depending on the type of DNA test the markers and values will vary. For some test types, the companies provide an ethnicity prediction based on comparison to the population database used by the testing company. Notice use of the phrase "the testing company" above. This means you may get different lists of people with matching DNA at each company because different people tested at each company and different ethnicity predictions because each company uses a different population database. This is why testing at all three companies is recommended. More on test types, databases, and ethnicity predictions below. What kinds of tests are offered for genetic genealogy? Y-DNA tests have been offered for about fifteen years now. Only men have Y-DNA; Y-DNA is passed from father to son. You can only learn about the direct patrilineal line of the man tested, and Y-DNA can be traced back many generations. Mitochondrial DNA (mtDNA) tests have also been offered for about fifteen years now. Both men and women have mtDNA; mtDNA is passed from mother to all children; only daughters pass mtDNA to the next generation. You can only learn about the direct matrilineal line of the person tested, and mtDNA can be traced back many generations. Autosomal DNA (atDNA) tests have been widely available for over five years now. Both men and women have atDNA; atDNA is passed from both parents, they inherited it from both of their parents, and so on. You can learn about every line on the pedigree chart of the person tested, but atDNA can only be traced back easily and reliably a limited number of generations. As you go back more generations it generally gets more difficult to use atDNA for genealogical evidence. What can you learn from a Y-DNA test? See Debbie Parker Wayne, "Using Y-DNA for Genealogy," National Genealogical Society, NGS Magazine 40 (January-March 2014): 20-24; PDF online (http://debbiewayne.com/pubs/pub_NGSMag_201311_Y-DNA_ALL.pdf : accessed 3 January 2015). What can you learn from an mtDNA test? See Debbie Parker Wayne, "Using mitochondrial DNA for Genealogy," National Genealogical Society, NGS Magazine 39 (October-December 2013): 26-30; PDF online (http://debbiewayne.com/pubs/pub_NGSMag_201308_mtDNA_ALL.pdf : accessed 3 January 2015). What can you learn from an atDNA test? Debbie Parker Wayne, "Using X-DNA for Genealogy," National Genealogical Society, NGS Magazine 40 (July-September 2014): 57-61; PDF online (http://debbiewayne.com/pubs/pub_NGSMag_201405_X-DNA_ALL.pdf : accessed 3 January 2015). Which company should I test with ... if I am interested in testing myself and I have no specific goal in mind? I just think DNA testing is cool and I want to do it. Take an autosomal DNA test with all three of the "big" genetic genealogy testing companies. If you also want to contribute to anthropological discoveries for the human race test at National Geographic Genographic Project. This can be accomplished by ordering individual tests from each company or by testing separately at 23andMe and AncestryDNA then transferring results from AncestryDNA to Family Tree DNA. Family Tree DNA does the lab work for National Geographic so results from the Genographic Project can be transferred to the Family Tree DNA database then additional tests can be ordered using the same DNA sample provided for National Geographic. The only test offered by three of the companies is primarily an autosomal test so you don't have to know a specific name for the test. Family Tree DNA offers other tests so you must order a "Family Finder" test to get the autosomal DNA test there. Does my ethnicity affect which company I should test with? African American ancestry: 23andMe actively recruited African and African American testers so have a significant number of testers in their database. AncestryDNA, by providing access to many family trees and documents, can make it easier to see patterns that can link slaveholders and ancestors who were held in slavery. Family Tree DNA uses a higher threshold that seems to result in fewer DNA matches for many African American researchers. American Colonial ancestry: AncestryDNA's database includes more testers with deep colonial American ancestry, but all of the testing companies cover many in this category. Ashkenazi Jewish ancestry, and others where small populations intermarried: These intermarriages result in a lot of small shared DNA segments that confuse the algorithms into predicting a closer relationship between two testers. Family Tree DNA has a lot of expertise in this area for those with Ashkenazi Jewish ancestry. AncestryDNA modified their match algorithm recently and may get better in this area. 23andMe limits the number of matches seen by a tester so some relatives may not be seen in the DNA match list. Native American: Where Native American ancestry is suspected on the direct patrilineal line a Y-DNA test gives conclusive results. Where Native American ancestry is suspected on the direct matrilineal line an mtDNA test gives conclusive results. Where Native American ancestry is suspected on other lines, an autosomal DNA may or may not provide evidence. If the Native American ancestor is within five or so generations of a tester, it is likely to be detected. If it is more generations to the Native American ancestor, or random recombination of DNA resulted in the tester not having a detectable amount of DNA from that particular ancestor, Native American ancestry may not be detected even though it exists in the lineage. Testing other cousins in this line may result in detectable amounts of Native American DNA. Old World lineage (not North or South American): Today, 23andMe and Family Tree DNA have more testers in their databases from outside of the Americas. AncestryDNA is about to offer testing outside of the USA so their database of testers from other locales may grow soon. Will I learn about health related issues from a genetic genealogy test? If you are interested in learning health related information, testing at 23andMe or AncestryDNA will provide more medically-significant markers. The data from the testing company can be analyzed by Promethease or other third-party tools. At some point in the future, 23andMe may again provide links to the medically significant information without the need for a third-party tool. Which testing company is easiest? I don't have time to learn how to analyze DNA. Testing at AncestryDNA may be the easiest for those who are not willing to invest time in learning how to use DNA results effectively for genealogical research. A public tree on Ancestry helps to get the most from a DNA test taken at Ancestry. AncestryDNA does not provide the detailed segment data needed to make use of the most popular DNA analysis tools. Those who have tested at AncestryDNA and want to do detailed analysis must upload the raw DNA data to a third-party website (such as GEDmatch) or use third-party utilities (of which there are many). Comparisons can only be done with others who have also uploaded to the same site. You can learn SO MUCH MORE from your DNA tests if you are willing to invest some time in learning how DNA answers genealogical questions. The image above labeled "Partial Display of Mapped Chromosome Segments" shows how some are mapping particular segments of chromosomes to specific ancestors using detailed DNA analysis and tools written by genetic genealogists with programming skills. geralt, stress___burnout-231452_1280.jpg, "Burnout Man Psychology Rays Stress Hand Face Old," PixBay (http://pixabay.com/en/burnout-man-psychology-rays-stress-231452/ : accessed 16 July 2014), Public Domain CC0 license. How do I learn to make effective and detailed use of DNA to answer genealogical questions? Debbie Parker Wayne, "DNA Reference Works," (http://debbiewayne.com/presentations/gatagacc_biblio.php : accessed 3 January 2015). ________, "Learning About Autosomal DNA for Genealogy," Deb's Delvings Blog, posted 29 October 2013 (http://debsdelvings.blogspot.com/2013/10/learning-about-autosomal-dna-for.html : accessed 3 January 2015). ________, "Prep for Genetic Genealogy Training at Institutes," Deb's Delvings Blog, posted 4 December 2014 (http://debsdelvings.blogspot.com/ : accessed 3 January 2015). Kelly Wheaton, Beginner’s Guide to Genetic Genealogy (https://sites.google.com/site/wheatonsurname/beginners-guide-to-genetic-genealogy/ : accessed 3 January 2015). DNAadoption offers various online genetic genealogy classes (http://dnaadoption.com/index.php?page=online-classes : accessed 3 January 2015). Practice the techniques on your own family data. Choosing a testing company when you can't afford to test at all three may be affected by the following considerations. Is support via telephone an important consideration? Both Family Tree DNA and AncestryDNA provide telephone support, but the knowledge level of the customer service representatives covers a wide spectrum. In my experience and anecdotally, Family Tree DNA excels in both telephone and e-mail support to customers, quickly getting more knowledgeable persons involved if the first rep contacted cannot answer a question. 23andMe offers support online and not via telephone. Their customer support representatives have a reputation for providing knowledgeable and useful answers. Are you testing an elderly relative who has trouble producing saliva? Family Tree DNA uses a cheek swab to obtain a DNA sample (the tester rubs the swab on the inside of the cheek, cheek cells collect on the cotton swab). This is easier for many elderly people. As a special request option, 23andMe offers a test kit that requires less saliva than the standard test. The ways we use DNA and the tools we use will continue to advance and change over the coming years. We will all need to continue our education as those advances come. ** Disclaimer: I coordinate the "Practical Genetic Genealogy" courses offered at GRIP and the "Getting Started with Genetic Genealogy" course offered in 2015 at SLIG. Back in 2010 I started planning topics I thought should be offered in a week-long institute for genetic genealogists. I then searched for the best people to help teach the course and found CeCe Moore and Blaine Bettinger. We had similar ideas about what was needed to bring the genealogy and genetic genealogy communities together. CeCe and Blaine helped refine the session topics based on their experiences. In July 2014 our plans came to fruition with the first "Practical Genetic Genealogy" course offered at GRIP. More and more institutes and conferences are offering more advanced genetic genealogy education. Debbie Parker Wayne, "Which DNA test should I take?," Deb's Delvings Blog, posted 3 January 2015 (http://debsdelvings.blogspot.com/ : accessed [date]).